If the Magic Elf is touched, it loses its powers. 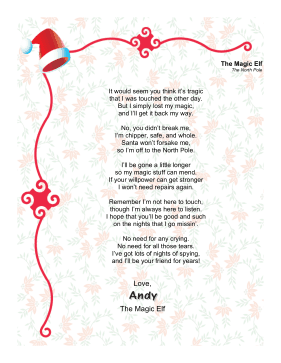 This letter reassures children that the magic will return. that I was touched the other day. and I'll get it back my way. I'm chipper, safe, and whole. so I'm off to the North Pole. so my magic stuff can mend. I won't need repairs again. though I'm always here to listen. on the nights that I go missin'. No need for any crying. No need for all those tears. and I'll be your friend for years!